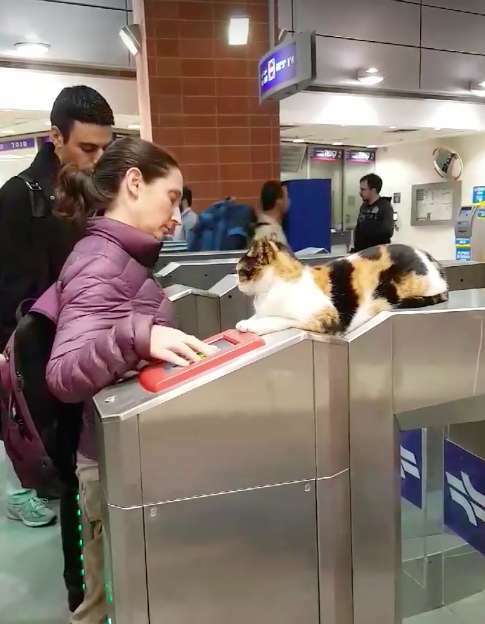 At a train station in Israel, a cat named Shawarma has staked out a place near the turnstile. Apparently Shawarma likes watching people as they pass through and supervises them s they validate their tickets before going through. Of course, Shawarma is fickle like most cats. Some passengers can pet the cat but some get a swipe or a bite if they try. The local mayor even showed up to bring the cat treats and pet it, which goes to show that even politicians know that cats are more powerful and influential than they are. To learn more about the cat that watches Israeli commuters, click here.